Rheumatoid arthritis (RA) is associated with amino acid variants in multiple MHC molecules. The association to MHC class II (MHC-II) has been studied in several animal models of RA. In most cases these models depend on T cells restricted to a single immunodominant peptide of the immunizing Ag, which does not resemble the autoreactive T cells in RA. An exception is pristane-induced arthritis (PIA) in the rat where polyclonal T cells induce chronic arthritis after being primed against endogenous Ags. In this study, we used a mixed genetic and functional approach to show that RT1-Ba and RT1-Bb (RT1-B locus), the rat orthologs of HLA-DQA and HLA-DQB, determine the onset and severity of PIA. We isolated a 0.2-Mb interval within the MHC-II locus of three MHC-congenic strains, of which two were protected from severe PIA. Comparison of sequence and expression variation, as well as in vivo blocking of RT1-B and RT1-D (HLA-DR), showed that arthritis in these strains is regulated by coding polymorphisms in the RT1-B genes. 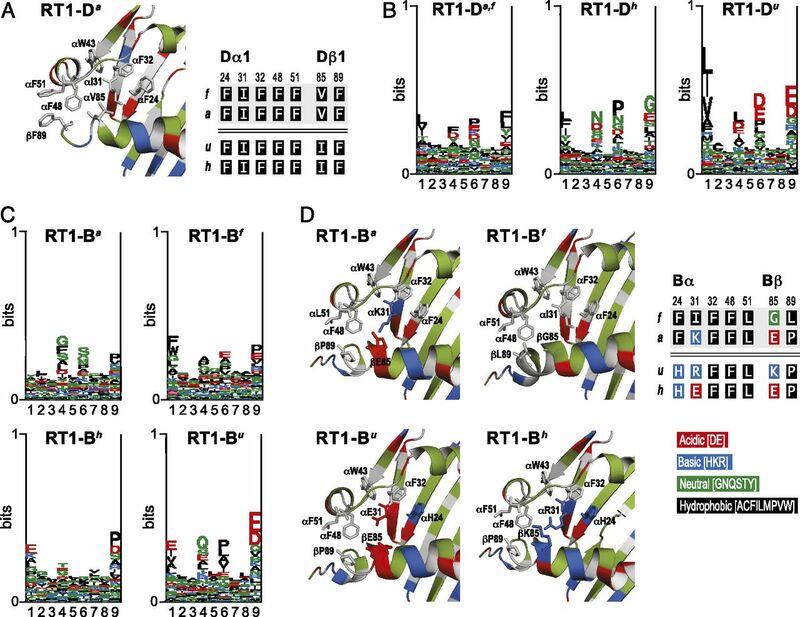 Motif prediction based on MHC-II eluted peptides and structural homology modeling suggested that variants in the RT1-B P1 pocket, which likely affect the editing capacity by RT1-DM, are important for the development of PIA. Rheumatoid arthritis (RA) is a chronic autoimmune disorder that affects 0.5–1% of the general population and is characterized by an erosive inflammation of the articular cartilage and destruction of the synovial joints. Susceptibility to RA is associated with an epitope in the third hypervariable region of the HLA-DRβ chain, which is shared between HLA-DR1 and HLA-DR4 serotypes (1). This shared epitope association was recently refined to the amino acid positions 71 and 74 in patients with seropositive RA (2). This subtype of RA is also associated with amino acid polymorphisms in HLA-DP and the MHC class I (MHC-I) molecule HLA-B (2). The association to three different MHC proteins as well as a difference in association between subgroups of RA (3, 4) suggest that multiple MHC-dependent mechanisms contribute to the development and perpetuation of RA. There are several lines of evidence indicating that CD4+ αβ T cells (hereafter CD4 T cells) play a central role in the initiation of RA. This includes the aforementioned association between MHC class II (MHC-II) and RA as well as the abundant infiltration of T cells into synovial fluid and the proven effectiveness of therapies that target T cell–derived cytokines, such as TNF-α (5, 6). Joint-infiltrating T cells in RA are of poly- or oligoclonal origin and therefore likely to have a broad Ag specificity (7, 8). This is in contrast to most animal models of RA, such as the collagen-induced arthritis and the K/BxN model, where the initiation of arthritis relies on a single peptide–MHC interaction (9, 10). In this study, we evaluated the functional role of MHC polymorphisms for the development of pristane-induced arthritis (PIA), an autoimmune model of RA. PIA is driven by polyclonal T cells and is independent of exogenous Ags for its induction (11). Rats with PIA show clinical and subclinical manifestations that closely resemble RA (12, 13): the disease develops symmetrically, is chronic relapsing, and affects the peripheral joints of the extremities. Additionally, rats with PIA are positive for rheumatoid factor, and the clinical disease is preceded by a marked increase of acute-phase proteins in the blood (14, 15). CD4 T cells from rats with PIA induce arthritis when transferred to MHC-syngenic recipients (11, 16), and the onset and severity of the disease are influenced by genes within or close to the MHC locus (13, 17). However, so far there has been no evidence that polymorphisms in the MHC-II genes, or in any other genes in the MHC region, affect the development of PIA. The mechanisms by which pristane induces autoaggressive CD4 T cells to attack the joints is not known. Autoantibodies and T cells reactive to cartilage proteins have been identified but seem to be more associated with the chronic stage of PIA (12). Administration of pristane activates an innate response, indicated by increased IL-6 and acute phase reactants (15), which most likely stimulates Ag presentation in the draining lymph nodes (dLNs). Because no exogenous Ag is involved in the priming of the immune system, and mineral oils, such as pristane, also induce arthritis under germ-free conditions (18), naive T cells are likely to respond to self-peptides presented by MHC-II molecules. Hence, the priming that precedes the clinical onset of arthritis may resemble aspects of the autoimmune response in RA. We recently established a panel of MHC-recombinant strains to identify genes associated with T cell selection and MHC expression (19). This panel consists of congenic MHC haplotypes from three inbred strains, that is, KHW (RT1h), AS2 (RT1f), and E3 (RT1u), introgressed on a DA (RT1av1) background. Two recombination hotspots were identified close to RT1-DMb and Btnl2 in the MHC-II region, which mark the outer boundaries of a 206-kb haplotype we named T cell selection quantitative trait locus (QTL) 2 (Tcs2) (19). Tcs2 contains 12 genes, 6 of which contain 7 or more nonsynonymous substitutions (Tap1, Tap2, RT1-DOb, RT1-Bb, RT1-Ba, and RT1-Db1) and 6 of which are conserved or show limited variation (Psmb8, Psmb9, RT1-Db2, RT1-DMb, Btnl2, and RT1-Da). In this study, we describe the influence of four different Tcs2 haplotypes on PIA. First, to identify the disease associated MHC-II genes, we correlated coding variants in Tcs2 with arthritis severity and then confirmed the association by blocking the encoded molecules in vivo. Second, we analyzed the correlation between MHC-II surface expression and disease development. Lastly, we compared homology models and peptide elution profiles between the associated MHC-II molecules to probe whether shared structural features may explain the difference in arthritis manifestation. DA/OlaHsd (Harlan Europe, Horst, The Netherlands) were maintained by sister/brother mating in a barrier facility at the Scheele Laboratory, Karolinska Institute, and were specific pathogen-free according to the current Federation of European Animal Laboratory Science Associations guidelines (20). The facility is climate-controlled with 14 h light/10 h dark cycles. Animals were housed in individually ventilated microisolator cages (Allentown) containing aspen wood shavings (Tapvei), and they were fed standard rodent chow (R70, Lantmännen) and had free access to water. The generation of recombinant congenic strains has been described previously (19). Congenic fragments in DA.1FR2 (RT1f), DA.1HR2 (RT1h), and DA.1UR2 (RT1u) span from 1.62 to 5.98 Mb (position of the closest negative DA marker) and are derived from the AS2, KHW, and E3 strains, respectively. Congenic strains were originally established on DA/Ztm background (n > 20) and thereafter further backcrossed to DA/OlaHsd (n > 5). Animals were 7–12 wk old at the start of the experiments (the age span between the youngest and the oldest rat in one experiment was <6 d). Tcs1- and Tcs2-congenic strains are available without restrictions from the Rat Resource and Research Center, Department of Veterinary Pathobiology, University of Missouri (Columbia, MO). Rats were intradermally injected at the dorsal side of the tail base with 100 μl pristane (2,6,10,14-tetramethylpentadecane, 95%; Acros Organics, Morris Plains, NJ). Strains (or treatment groups) were mixed and housed together in cages for at least 2 wk prior to the start of the experiment, and no animals were removed from an ongoing experiment. Arthritis was monitored in a blinded fashion as described previously (12). In brief, 1 point was given for each inflamed (i.e., erythematic and swollen) knuckle or toe and up to 5 points was given for an affected ankle (in total 15 points per paw). No scores were given for deformation if not accompanied by erythema. Because different researchers have evaluated the clinical disease, the maximum scores may vary between experiments. Weight change was included in some experiments as an objective measure of disease severity. α-1-Acid-glycoprotein (AGP; Life Diagnostics) was measured by ELISA according to the manufacturer’s instructions. All experiments were approved and performed in accordance with the guidelines from the Swedish National Board for Laboratory Animals and the European Community Council Directive (86/609/EEC). Genomic DNA was extracted from progeny biopsies as described previously (12). PCR primers for short tandem repeats were retrieved from the Baylor 3.4/rn4 2004 genome sequence assembly and designed using the PrimerSelect 8.1.3 software (Lasergene; DNASTAR, Madison, WI) (see Ref. 19 for a list of primer sequences). Forward primers were fluorescently labeled with 6-FAM, HEX, VIC, PET, or NED (MWG Biotech, Risskov, Denmark). Short tandem repeats were amplified with PCR according to standard protocols, diluted in HPLC water, combined with size standard Liz-600 in 10 μl HiDi formamide (both from Applied Biosystems) and analyzed on a 48-capillary 3730 DNA analyzer (Applied Biosystems). Rats were sacrificed on day 20 or 83 after immunization. Hind paws without skin were fixed for 4 d in 3% phosphate-buffered formaldehyde and thereafter decalcified for 4 d in 50% formic acid containing 1.5% phosphate-buffered formaldehyde and embedded in paraffin. Tissue sections were stained with H&E. For quantification of MHC-II on macrophages (Mϕ) and dendritic cells (DC), a pair of inguinal LNs (iLNs) was digested for 20 min at 37°C with 2 ml digestion buffer (2.5 mg/ml collagenase IV; Sigma-Aldrich, St. Louis, MO), 0.2 mg/ml bovine pancreas DNase I (Roche Applied Science), and 2% low IgG FCS (Life Technologies Laboratories) in HBSS (Sigma-Aldrich). Undigested material was disrupted by pipetting and an additional 2 ml digestion buffer was added; digestion was stopped after 10–15 min by adding EDTA (Merck) to a final concentration of 20 mM. Cells were filtered through 40-μm cell strainers and washed twice in ice-cold FACS buffer (Ca2+- and Mg2+-free Dulbecco’s PBS supplemented with 1% FCS, 10 mM EDTA, and 0.02% NaN3). Pellets were resuspended in 2 ml 1.115 g/ml Percoll Plus medium (GE Healthcare Life Sciences). For the gradient centrifugation, 2 ml 0.15 M NaCl was added to FCS-coated polypropylene tubes (BD Falcon), which were underlayered with 2 ml 1.065 g/ml Percoll medium and thereafter with the Percoll-resuspended cell pellets. After centrifugation (20 min, 400 × g), the top layer, containing DC and Mϕ, was recovered and washed in FACS buffer. The cells were added in duplicates to 96-well V-bottom polypropylene plates (BD Falcon) at 106 cells/well and incubated with saturating concentrations of mAbs (see below). Cells were washed with FACS buffer and incubated in BD Cytofix/Cytoperm for 20 min at room temperature and washed twice in BD Perm/Wash before staining with Abs to CD68. Fluorescence minus one controls were used in all experiments. Dead cells were stained with Live/Dead Violet (Invitrogen) after washing the cells twice in Dulbecco’s PBS without sodium azide and FCS. A SORP BD LSR II analytic flow cytometer (BD Biosciences) was used for acquisition and the data were analyzed with FlowJo (Tree Star). The following Alexa Fluor 488–, PE-, Pe-Cy5–, PerCP-Cy5.5–, allophycocyanin-, Alexa Fluor 648–, Qdot-655–, and biotin-conjugated Abs were used for flow cytometry: 2.4G2/BD Fc Block (CD32), OX-35 (CD4), OX-6 (RT1-B), and OX-17 (RT1-D), purchased from BD Pharmingen (San Diego, CA); OX-33 (CD45RA), R73 (αβTCR), OX-62 (CD103), 14-4-4S (antimouse I-Ek/rat RT1-D), and 6D5 (anti-mouse CD19), purchased from BioLegend (San Diego, CA); and ED1 (CD68), purchased from AbD Serotec. Monoclonal mouse OX6 (anti–RT1-B, IgG1)-, OX17 (anti–RT1-D, IgG1)-, and OX8 (anti-CD8a, IgG1)-producing B cell hybridomas were cultured in DMEM medium (high glucose, GlutaMAX, pyruvate) completed with 50 μM 2-ME, 10 mM HEPES, 100 U/ml penicillin, 100 μg/ml streptomycin, 5–20% ultra-low IgG FBS (Life Technologies). Ab was purified from 0.2-μm-filtered culture supernatant on a protein G–coupled Sepharose column with an Äkta purifier (GE Healthcare). 14-4-4S (anti-mouse/rat I-E/RT1-D, IgG2a) was purchased from Bio X Cell. F(ab′)2 fragments were produced with the Pierce mouse IgG1 Fab and F(ab′)2 preparation kits (OX6, OX17) or Pierce F(ab′)2 preparation kit (14-4-4S) (Thermo Scientific) according to the manufacturer’s instructions. Size and purity of the intact Ab and the F(ab′)2 fragments were analyzed by SDS-PAGE (NuPage; Invitrogen) followed by Coomassie staining (Supplemental Figs. 2, 4). Ficin-digested OX6 and OX17 F(ab′)2 contained ∼5–10% residual whole IgG, whereas no residual IgG was detected after pepsin digestion of 14-4-4S. The binding of the F(ab′)2 fragments to MHC-II was evaluated by assessing their blocking capacity of fluorescent-conjugated OX6, OX17, and 14-4-4S Abs (data not shown). For treatment of rats with PIA, whole IgG or F(ab′)2 fragments were injected s.c. at each side of the tail base on days 2 and 4 (unless stated otherwise) after pristane immunization (0.3 mg/d/rat). Rats shown in Fig. 4C were injected with 0.3 mg OX8 s.c. at each side of the tail base (0.6 mg in total) and immediately thereafter immunized with pristane. DA and DA.1UR10 rats were immunized with 0.1 mg pepsin-digested collagen type II purified from rat chondrosarcoma (21), which was dissolved in 0.1 ml 0.1 M acetic acid and emulsified in an equal volume of IFA (Difco Laboratories). iLN cells (106) from these rats were restimulated in vitro with 50 μg/ml collagen type II (in 0.2 ml DMEM medium containing 5% FCS), with or without 10 μg/ml whole IgG or F(ab′)2, for 72 h at 37°C. IFN-γ and IL-17 in culture supernatants were quantified by ELISA using 2 μg/ml anti-rat IFN-γ (DB1; BioLegend) or 2 μg/ml anti-mouse IL-17 (PN 840525; R&D Systems) as capture Abs together with biotinylated 0.5 μg/ml anti-rat IFN-γ (Poly5109; BioLegend) or 0.4 μg/ml anti-mouse IL-17 (PN 840526; R&D Systems) for detection. Eu3+-conjugated streptavidin (DELFIA; PerkinElmer) was used as a secondary reagent. Fluorescence was detected on a Synergy 2 multi-mode microplate reader. All values are represented as relative fluorescence units. Establishment and cloning of the T cell hybridoma clone P7LSc-3e3 restricted to the mouse I-Er molecule was performed essentially as described previously (22) with the exception that B10.RIII mice (H-2r) were immunized and LN cells subsequently restimulated in vitro with a synthetic peptide corresponding to position 87–110 on myelin basic protein (MBP87–110; PVVHFFKNIVTPRTPPPSQGKGRG). Activation of T cell hybridomas was determined by measuring IL-2 production as previously described (23). Protocol for the elution of MHC-II–bound peptides was adapted from Fissolo et al. (24). In brief, cell lysates were prepared from pooled (5–10 rats/experiment) iLN pairs harvested on day 5 after pristane injection. iLNs were homogenized in PBS containing 1.2% CHAPS (Roche Diagnostics) and complete protease inhibitor (Roche Diagnostics) using a Heidolph DIAX 900 homogenizer. To lyse cells and release membrane-bound MHC-II molecules, cell suspensions were gently rotated for 2 h at 4°C with a sonication step after 1 h (three 20-s pulses, 75% amplitude). Lysates were centrifuged at 4600 rpm for 20 min to pellet and remove cell debris. Clarified lysate was further ultracentrifuged at 40,000 rpm for 1 h at 4°C and sterile filtered with a 0.2-μm vacuum filter (Nalgene). MHC-II was precipitated by running the cell lysate cyclic over immunoaffinity columns. Then, 7.5 mg Ab (OX17 for RT1-D or OX6 for RT1-B) was coupled to CNBr-activated Sepharose 4 beads (GE Healthcare) after activation of the beads with 1 mM HCl and two washing steps with coupling buffer (0.5 M NaCl, 0.1 M NaHCO3). Uncoupled residues on the beads were blocked with 0.2 M glycine (pH 8.0; ICN Biomedicals) and washed with three cycles of alternate pH washing (0.1 M sodium acetate/0.5 M NaCl [pH 4.0] and 0.1 M Tris-HCl/0.5 M NaCl [pH 8.0]). Unspecific binding was assessed with beads coupled with an isotype control Ab. After immunoprecipitation, the peptides were eluted in eight steps with 0.2% trifluoroacetic acid (Sigma-Aldrich). Eluted peptides were separated from coeluted MHC-II molecules by filtration through a 3-kDa ultrafilter (Millipore) and subsequently lyophilized. Samples were reconstituted in 100 μl 0.1 M HOAc and 25 μl was cleaned with a strong cation exchange (SCX) column. New C18 and SCX columns were used for the cleanup for each sample to avoid carryover. Peptides were eluted directly from SCX to the C18 precolumn and run with a 120-min gradient (0–40 B; B is 0.1 M HOAc, ACN) on the Orbitrap XL (Thermo Fisher) or Orbitrap Velos (Thermo Fisher). Raw data were searched with the Mascot search engine with the following parameters: SwissProt database (Rodentia limit) (SwissProt 57.15 [515,203 sequences; 181,334,896 residues]), no enzyme, variable modifications, oxidation (M), oxidation (P), and oxidation (K); peptide mass tolerance, ±25 ppm (no. 13C = 1); fragment mass tolerance, ±0.6 Da. The searches were combined in Scaffold 3.0 for data analysis. Homology models of the investigated haplotypes were generated by adjustment of the sequence of the mouse RT1-B ortholog, I-Aq, whose crystal structure we recently determined (unpublished results). Nonconserved amino acids were manually exchanged using WinCoot (25). Side chain conformations were chosen that are observed in other MHC-II of known structure and/or are energetically preferred, cause the least steric clashes, and interact optimally with surrounding residues. We first compared the disease course between the background DA strain and three strains with congenic inserts of ∼4 Mb across the MHC region (Fig. 1A). These strains showed a comparable incidence of arthritis (typically 100%) but differed in the onset and severity of disease: DA.1FR2, which expresses the RT1f haplotype, showed an exacerbated disease phenotype (Fig. 1B), whereas DA.1UR2 (RT1u) and DA.1HR2 (RT1h) were protected from severe arthritis (Fig. 1C, 1D). Susceptibility to PIA among different MHC-congenic strains. (A) Illustration depicting the approximate positions of congenic intervals (vertical gray lines) in DA.1FR2, DA.1UR2, DA.1HR2, and DA.1HR61. Positions are indicated in megabases. (B–D) Development of PIA in DA.1FR2 (B), DA.1UR2 (C), and DA.1HR2 and DA.1HR61 (D) as compared with DA littermates. In (D), a mix of DA littermates from both DA.1HR2 and DA.1HR61 was used. Data show mean values ± SEM. Numbers in brackets represent number of rats per group (arthritic/total). Representative experiments of two (DA.1UR2, DA.1FR2) to three (DA.1HR2) individual experiments are shown. Significance was determined by a Mann–Whitney U test. *p < 0.05, **p < 0.01, ***p < 0.01. xMHC I, extended MHC-I region. To assess whether the variation in PIA was associated with genes in the MHC-II region, we compared PIA development in a panel of intra-MHC recombinant congenic strains (19) (Fig. 2A). DA.1FR9, which is derived from DA.1FR2, showed an exacerbated disease phenotype (Fig. 2B) similar to its parental strain (Fig. 1B). We could map this effect to the Tcs2 interval using congenic strains with RT1f fragments that partly overlapped with DA.1FR9 (except in Tcs2), but that did not show a disease exacerbation (Supplemental Fig. 1A, 1B). PIA onset and severity but not chronicity is regulated by a 206-kb interval (Tcs2) in the MHC-II region. (A) The arthritis-associated Tcs2 locus spans from exon 3 in RT1-DMb through exon 6 in Btnl2 (see Ref. 19 for a detailed map). 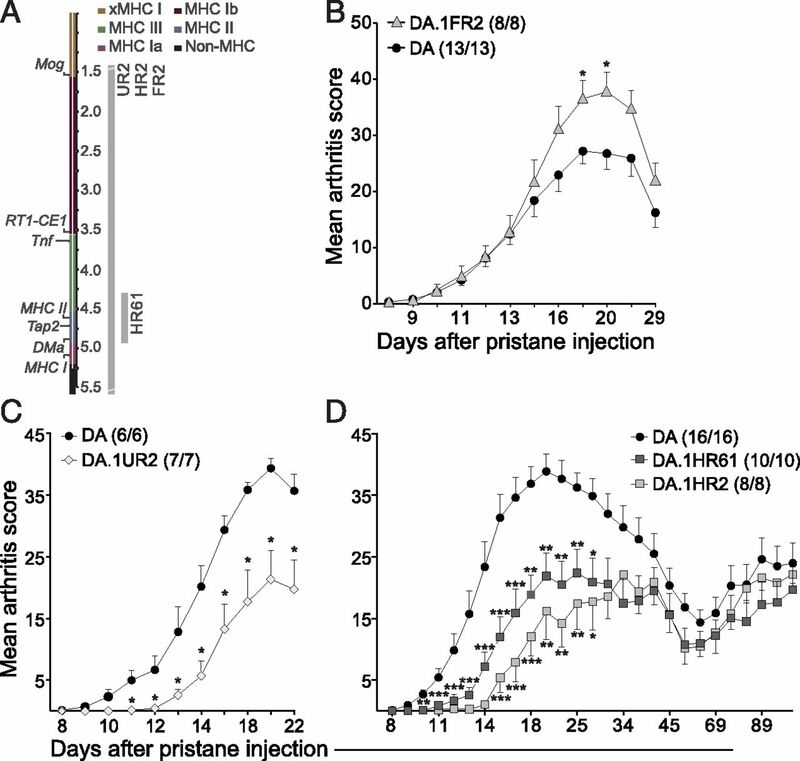 (B) Arthritis development in MHC-II–congenic strains and DA after injection of pristane. Number of rats per group is shown in brackets. (C) Arthritis incidence and onset for animals shown in (B). Strains are indicated according to haplotype: DA (a), DA.1FR9 (f), DA.1HR61 (h), and DA.1UR10 (u). (D) AGP measured in blood on days 5, 20, and 100 after immunization. (E) Weight difference day 20 versus day 0. (F) Histopathology of hind paws on days 20 (left panel) and 83 (right panel) after immunization showing tibia (ti) and talus (ta), necrosis (n), pannus (p), synovial infiltration (i), cartilage infiltration (ci), bone infiltration (bi), and new cartilage formation (cf). Animals in (F) are not from the same experiment as in (A)–(E). H&E stained. Original magnification ×25. (G) Effect of Tcs2 heterozygosity on PIA. Data shown in (B) are mean values ± SEM; vertical and horizontal lines in (C)–(E) represent mean values. Symbols shown in (B): ϕDA.1FR9 significant versus DA, *DA.1UR10 significant versus DA, φDA.1HR61 significant versus DA.1UR10. One symbol indicates p < 0.05; two symbols, p < 0.01; three symbols, p < 0.001 (statistics were determined with the Mann–Whitney U test). DA.1UR10 and DA.1HR61 were protected from severe arthritis (Fig. 2B) similar to their parental strains DA.1UR2 and DA.1HR2 (Fig. 1D shows a direct comparison between DA.1HR2 and DA.1HR61). Also, the onset of arthritis was significantly delayed in these strains (Fig. 2C, right panel), which in DA.1HR61 led to lower serum levels of AGP (Fig. 2D) and increased weight gain (Fig. 2E) compared with DA rats. Additionally, both DA.1HR61 and DA.1UR10 showed less cartilage destruction and synovial infiltration of joints at day 20 after immunization (Fig. 2F, left panel). Whereas the congenic interval in DA.1UR10 corresponds to Tcs2, the effect in DA.1HR61 could be mapped to Tcs2 with the strain DA.1HR62 (Supplemental Fig. 1C). Further analyses of PIA in heterozygous DA.1HR61 and DA.1UR10 rats showed that the disease protection was recessive in DA.1HR61 whereas it was dominant in DA.1UR10 (Fig. 2G). Although the allelic variation in the MHC-II region had a substantial impact on the acute phase of PIA, arthritis scores (Figs. 1D, 2B), AGP levels (Fig. 2D), and joint histopathological changes (Fig. 2F, right panel) in rats with chronic arthritis (day > 65) were comparable between the strains. Taken together, these findings identify Tcs2 as a major QTL for the regulation of arthritis onset and severity in acute PIA. Next, to pinpoint the genetic variants responsible for the effect of Tcs2, we compared sequence variants in DA.1FR9 to variants found in the Tcs2 locus of DA as well as to the protected strains DA.1HR61 and DA.1UR10. We took advantage of the fact that DA and DA.1FR9 share a high degree of sequence homology (15). Three of the five genes encoding classical MHC-II proteins in Tcs2, that is, RT1-Dα, RT1-Dβ1, and RT1-Dβ2, are encoded by the same alleles in these strains, and RT1-DMβ, a nonclassical MHC-II protein, is identical on the protein level (Fig. 3A). Thus, 4 of 12 genes in Tcs2 did not contain any nonsynonymous coding polymorphisms that could explain the difference in disease severity between DA and DA.1FR9. Moreover, the two residues in RT1-DOβ that differed between DA and DA.1FR9 (G179S and Q191P) did not correlate with an increased severity of arthritis because these variants were conserved between DA.1FR9, DA.1HR61, and DA.1UR10 (Fig. 3B). Correlation between disease severity and coding polymorphisms in Tcs2. (A) Genes in Tcs2. Asterisked genes are conserved between the RT1f and RT1a haplotypes. (B) Polymorphic amino acid residues between the RT1a and RT1f haplotypes. Shaded boxes indicate amino acid residues that are unique to RT1f and that therefore correlate with the increased arthritis severity in DA.1FR9. Tcs2 also contains four genes in the MHC-I pathway: Psmb8, Psmb9, Tap1, and Tap2. Polymorphisms in Tap2 have previously been linked to variations in peptide loading and expression of MHC-I molecules (26, 27), as well as CD8 T cell selection (19). Tap2 as well as Tap1 and Psmb8 contained coding variants that were unique to DA.1FR9 and, hence, could be responsible for the increased arthritis severity in this strain (Fig. 3B, highlighted in gray). To assess whether genes in the MHC-I pathway could have an influence on the disease development in PIA, we used a set of MHC-I congenic strains (Fig. 4A) that express a variable number of polymorphic MHC-I isoforms (19). As shown in Fig. 4B, arthritis scores and weight indices of these rats were comparable to DA. Moreover, depletion of CD8 T cells prior to the induction of PIA in DA rats did not influence the disease course (Fig. 4C). Taken together, these experiments suggest that variants in Tcs2 that affect MHC-I presentation are not responsible for the association of PIA to Tcs2. Polymorphism in the MHC-Ia region is not associated with PIA. (A) Illustration of the Tcs1 locus. The classical MHC-Ia (RT1-A1, -A2, -A3) genes are indicated in bold. (B) Arthritis scores and relative weight loss in Tcs1 congenic rats immunized with pristane. 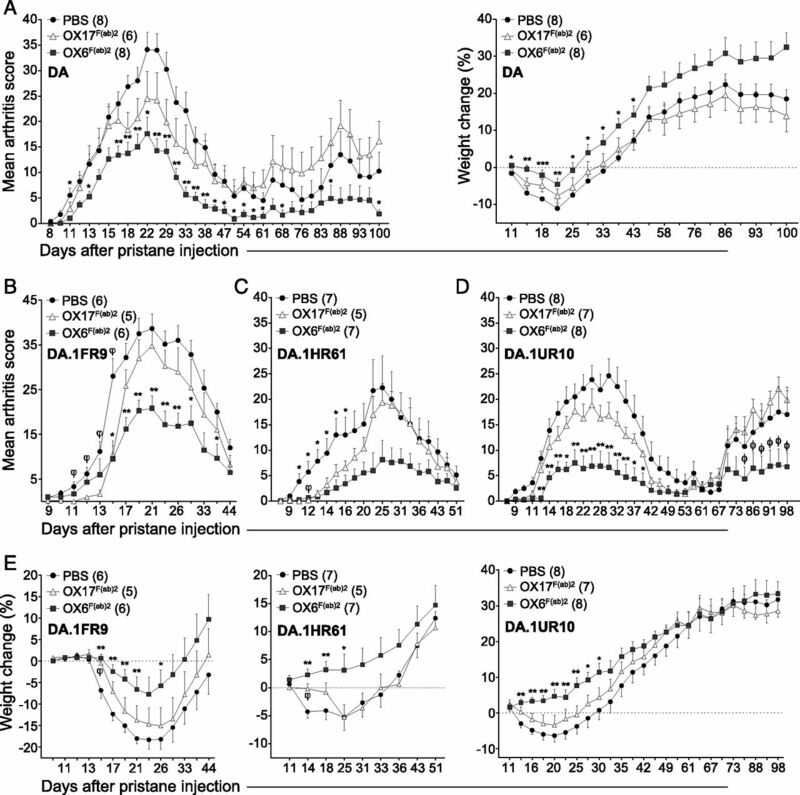 (C) Left panel shows arthritis scores in DA rats treated with an anti-CD8a Ab (OX8) on the day of pristane immunization. Right panel shows CD4 and CD8 T cells in the iLNs on day 5 after OX8 treatment. The increased arthritis susceptibility in DA.1FR9 must therefore be determined by variants in RT1-Bα and/or RT1-Bβ (Fig. 3B). These variants could also determine the disease protection in DA.1HR61 and DA.1UR10; however, based on the genetic analysis alone, we could not exclude that the protection in these strains was associated with variants in RT1-Dβ1 and/or RT1-DOβ. To confirm the RT1-B association in DA.1FR9 and to assess which of the two MHC-II molecules regulates arthritis in DA.1HR61 and DA.1UR10, we treated pristane-immunized rats with Abs to RT1-B and RT1-D.
To this end, we used two Abs, OX6 (anti-RT1-B) and OX17 (anti-RT1-D), which were administrated s.c. into DA rats on days 2 and 4 or on days 0, 2, 4, 6, and 8 after pristane immunization. Both the 2-d and 5-d treatment regimens resulted in a nearly complete suppression of arthritis (Supplemental Fig. 2A–C). However, the suppression was not dependent on whether the RT1-B or RT1-D molecule was targeted (Supplemental Fig. 2C), which suggested that these Abs did not only block the interaction between MHC-II and TCRs but also depleted MHC-II+ cells. Indeed, dLNs from rats treated with whole OX6 or OX17 IgG on days 2 and 4 showed a significant reduction of total B cells (shown for OX17 in Supplemental Fig. 2D). We therefore repeated the treatment in DA rats using F(ab′)2 fragments of OX6 and OX17. In contrast to whole IgG, treatment with OX17 F(ab′)2 did not protect the DA rats from arthritis (Fig. 5A, Supplemental Fig. 2B). Similar results were observed for DA.1FR9, DA.1HR61, and DA.1UR10 (Fig. 5B–E). In contrast, all strains, including DA.1HR61 and DA.1UR10, that were treated with F(ab′)2 fragments of OX6 showed a significant reduction in arthritis scores and weight loss (Fig. 5). F(ab′)2 fragments specific for RT1-B protect rats from severe arthritis. (A) DA rats treated on days 2 and 4 after pristane immunization with anti–RT1-B [OX6 F(ab′)2], anti-RT1-D [OX17 F(ab′)2], or vehicle alone (PBS). Panels show arthritis scores (left) and relative weight change (%) compared with day 10 after immunization (right). (B–D) Corresponding treatments in DA.1FR9 (B), DA.1HR61 (C), and DA.1UR10 (D). (E) Relative weight change for experiments depicted in (B)–(D). Weight change is shown as percentage increase/decrease versus day 9 for DA.1FR9 and DA.1UR10 and versus day 8 for DA.1HR61. Data show mean values ± SEM. For anti–MHC-II treatment in DA, DA.1HR61 and DA1FR9 representative experiments out of two individual experiments are shown. *OX6 F(ab′)2 significant versus PBS, φOX17 F(ab′)2 significant versus PBS, ϕOX17 F(ab′)2 significant versus OX6 F(ab′)2 (Mann–Whitney U test: one symbol, p < 0.05. Two symbols, p < 0.01). Because none of the strains injected with OX17 F(ab′)2 responded to the treatment, we had no evidence that OX17 F(ab′)2 efficiently blocked the MHC/TCR interaction. Thus, to assure that RT1-D is indeed not contributing to the induction of PIA, we repeated the treatment using a second Ab, 14-4-4S, which is directed to mouse I-E, but cross-reacts to an epitope on RT1-D (22) that is distinct from the OX17 binding site (Supplemental Fig. 3A–C). Both the whole Ab and F(ab′)2 fragments of 14-4-4S blocked the activation of an I-Er–restricted T cell hybridoma (Supplemental Fig. 3D) and, importantly, RT1-D–restricted Ag presentation in vitro (Supplemental Fig. 4). However, when we blocked Ag presentation in vivo, the 14-4-4S F(ab′)2 fragment did not reduce PIA severity in the Tcs2-congenic strains or in DA (Supplemental Fig. 4). Thus, RT1-D–restricted T cells appear to play a minor role in the regulation of PIA, whereas these results support that RT1-B mediates PIA. Our data show that PIA is genetically associated with RT1-B and that blocking the RT1-B/TCR interaction in the early stage of the disease reduces arthritis severity. We next asked whether the different susceptibility to PIA among the Tcs2-congenic strains could be associated with a differential expression of RT1-B on the cell surface of professional APCs. Cell surface expression of RT1-B and RT1-D was determined on Mϕ (αβTCR−CD45RA−CD68+CD103−) and DC (αβTCR−CD45RA−CD68+CD103+MHC-II+) from dLNs on day 5 after pristane immunization (Fig. 6A). At this time point, the frequency of Mϕ and DC among LN cells was comparable between the strains (Fig. 6A). As shown in Fig. 6B and 6C, RT1-B and, to a lesser extent, RT1-D were differentially expressed on both Mϕ and DC. However, the difference in RT1-B expression did not correlate with any of the measured disease parameters (onset, severity, and chronicity), as it was highest in DA and lowest in DA.1FR9. MHC-II expression on professional APCs after pristane administration. (A) Mϕ and DC in dLNs on day 5 after pristane immunization. Top and bottom panels show gating strategy and frequency of cells, respectively. (B and C) RT1-B and RT1-D expression on Mϕ (B) and DC (C). Scatter plots show mean fluorescence intensity (MFI) for MHC-II+ cells. Histograms show representative samples from DA (blue), DA.1FR9 (green), and DA.1HR61 (red). DA (a), DA.1FR9 (f), DA.1HR61 (h), and DA.1UR10 (u) are shown. A representative experiment out of two individual experiments is shown. Statistics were determined by a Mann–Whitney U test. *p < 0.05, **p < 0.01, significant differences compared with DA. Hence, the variation in expression levels of RT1-B does not explain its association to PIA. Because it was not the expression levels of RT1-B that determined the arthritis severity, we continued to investigate how coding polymorphisms in the RT1-B genes influenced the RT1-B peptide repertoire. We addressed the questions whether the antigenic peptide repertoire on RT1-B differs from the nonantigenic repertoire on RT1-D and whether the peptide repertoire in DA.1FR9 is distinct from the peptide repertoires in the less susceptible strains DA.1UR10 and DA.1HR61. We first immunoprecipitated MHC-II molecules from dLN cells of pristane-immunized rats, followed by acid elution and mass spectrometry analysis, to identify the MHC-II–bound peptides. The RT1-B and RT1-D ligandomes largely overlapped on the protein level but differed substantially on the peptide level (Table I). A noteworthy exception was that peptides derived from the MHC-II–associated invariant chain (Ii) were found exclusively associated with RT1-B. We did not detect any joint-specific Ags among the eluted peptides; however, we did identify peptides from highly abundant and ubiquitously expressed Ags recognized by autoantibodies in RA, for example, fibrinogen, fibronectin, and α-enolase. However, none of these Ags was uniquely associated with RT1-B or specific for the most susceptible strains (Table I). Based on the eluted peptides, we performed a motif prediction using the EasyGibbs server (28). The P1 pocket of RT1-D (which is lined by hydrophobic amino acids, Fig. 7A) was occupied by hydrophobic residues in all strains (Fig. 7B). This was in marked contrast to the P1 pocket of RT1-B (Fig. 7C), which had a preference for negatively charged Glu in the protected strains, that is, DA.1HR61 and DA.1UR10, whereas large hydrophobic residues filled the P1 in DA.1FR9 and no preferred anchor residue was observed for P1 in DA rats. The P4 pocket in RT1-B was dominated by neutral residues in all strains except in DA.1FR9. Whereas the preferences of the P6 pocket varied substantially between the strains, the P9 pocket preferred proline in DA, DA.1HR61, and DA.1FR9, although RT1-Bf and RT1-Bh could also harbor acidic residues (Fig. 7B, 7C). Peptide binding motifs and sequence variation in the P1 pocket of RT1-B and RT1-D. (A) Structural homology model and sequence alignment of residues involved in the formation of the P1 pocket of the RT1-D molecule. (B) Peptide binding motif prediction based on RT1-D eluted peptides from DA, DA.1FR9 (RT1a,f), DA.1HR61 (RT1h), and DA.1UR10 (RT1u) from immunized rats. (C) Peptide binding motifs of the RT1-B molecule of the RT1a, RT1f, RT1h, and RT1u haplotype. The y-axis (bits) indicates the information content at each position and corresponds to the height of a column of letters. Numbers 1–9 on the x-axis indicate the individual binding pockets. Datasets from three individual elution experiments for DA, DA.1UR10, and DA.1HR61 and two elution experiments for DA.1FR9 were combined for motif prediction. (D) RT1-B structural models of the P1 pocket and sequence alignment of the corresponding residues. Each haplotype has a unique pocket due to sequence variation at positions α24, α31, and β85 and β89. Color codes: acidic, negatively charged amino acids (red); basic, positively charged residues (blue); hydrophobic residues (black/gray); neutral residues (green). The predicted peptide motifs were in agreement with structural homology models of the peptide-binding groove of RT1-B and RT1-D (Fig. 7A, 7D). For example, the modeled P1 pocket of RT1-Bf had a predominance of hydrophobic amino acids (Fig. 7D), which supports the preference for hydrophobic anchor residues (Phe and Trp) predicted from the eluted peptides (Fig. 7C). Moreover, in DA.1UR10 and DA.1HR61, αHis24 together with the variants at position α31 and β85 do not make P1 suitable for large hydrophobic residues but should be ideal for Glu, which was also suggested by our motif prediction. Taken together, protective and promoting RT1-B molecules differed substantially in organization and occupancy of the peptide-binding groove. RT1-B in the strains DA.1HR61 and DA.1UR10, which develop less severe PIA, favored peptides with Glu as P1 anchor, whereas RT1-Bf preferred hydrophobic residues. Responsible for the binding of Glu in P1 of RT1-Bh and RT1-Bu is most likely αHis24 (Fig. 7D), which is associated with the binding of Glu in the mouse ortholog I-Ad (29). In this study we show that amino acid variants in the MHC-II molecule RT1-B regulate joint-specific autoimmunity upon immunization with the hydrocarbon pristane. The study takes advantage of a new set of MHC-II–congenic rat strains, each with a unique MHC-II haplotype, to address the functional role of MHC-II polymorphisms in a polyclonal autoimmune model of RA. Our data suggest that polymorphisms in the peptide-binding groove that determine the occupancy of the P1 pocket, rather than the origin of the presented Ags or the expression level of RT1-B, impact onset and severity of PIA. We positionally identified the RT1-B locus in PIA by using a combined genetic and functional approach, which included a comparison of nonsynonymous coding variants between alleles in four MHC-II haplotypes. The MHC-II is an exceptionally polymorphic region (30), particularly in the rat (19). However, the relatively high sequence homology between DA and DA.1FR9, which includes identical alleles of RT1-Db1, together with additional genetic and phenotypic information from DA.1HR61 and DA.1UR10, made it possible to position the RT1-B locus. For instance, we could show that two amino acid variants in RT1-DOβ are unlikely to cause the exacerbation of arthritis in DA.1FR9, because DA.1FR9 shares these variants with DA.1UR10 and DA.1HR61. On the contrary, we cannot exclude that polymorphisms in RT1-DOb contribute to the disease protection in DA.1HR61 and DA.1UR10, because RT1-DOb contains several nonsynonymous single nucleotide polymorphisms (19), of which three correlate with the protection in DA.1UR10 and DA.1HR61. Two highly diverse alleles of Tap2 contribute to the extensive polymorphism in the rat MHC-II locus (31, 32). We have previously shown that the Tap2 allele expressed in DA.1UR10 and DA.1HR61 reduces negative selection of CD8 T cells in the thymus when expressed in combination with RT1-Aa (the DA allele of MHC-I) (19). CD8 T cells with suppressive or regulatory capacity have been described in the rat (33, 34) as well as in a mouse model of RA (35). Thus, a change in the CD8 T cell repertoire could potentially influence the arthritis susceptibility in DA.1HR61 and DA.1UR10. However, we found that the arthritis protection in DA.1HR61 and DA.1UR10 was comparable to the protection in DA.1HR2 and DA.1UR2 and therefore not dependent on the expression of RT1-Aa or an altered CD8 T cell selection. We could also show that rats depleted of CD8 T cells prior to pristane administration (Fig. 4C) or shortly thereafter (data not shown) developed normal PIA and that the susceptibility of PIA was not associated with polymorphisms in the MHC-I locus itself. Taken together, these findings clearly demonstrate that genes involved in the processing and transportation of MHC-I peptides are not responsible for the association between PIA and Tcs2. Our set of Tcs2-congenic strains allowed us to test the correlation between MHC-II expression and arthritis susceptibility. In mice, the expression of MHC-II on Mϕ has been linked to phenotypic changes in T cell effector function (36), and polymorphisms in the proximal promoter of the MHC class II transactivator (CIITA) confer risk to inflammatory diseases in humans (37). It is difficult to investigate the link between the expression of disease-associated MHC molecules and disease severity in humans, because humans do not live in a controlled environment and do not have a synchronized disease onset. It was therefore important to show that the expression of MHC-II on pristane-primed APCs in the different Tcs2-congenic strains did not correlate with their susceptibility to PIA. However, it remains an open question as to what is the relationship between coding and regulatory variants in the MHC-II genes that regulate PIA. The Tcs2 locus seems to be the major QTL for PIA in the rat MHC region. The effect of the congenic fragments in DA.1UR2 and DA.1HR2 on arthritis was remarkably similar to the effect of the smaller recombinant fragments in the Tcs2-congenic strains, and even the small increase in arthritis severity in DA.1FR2 could be reproduced in DA.1FR9 and subsequently mapped to the Tcs2 locus. Moreover, the dominant suppression of E3 alleles in DA.1UR10 as shown in this study is very similar to the dominant effect of the E3 congenic fragment in the original congenic strain (17). Nevertheless, similar to association studies in RA, which have identified risk factors that differ between ethnically distinct populations (38, 39), there might also exist additional disease-modifying variants in the rat MHC encoded by alleles that were not captured in this panel of recombinant congenic strains. The identification of RT1-B as major regulator of PIA was confirmed by using anti-RT1-B F(ab′)2 fragments for treatment in vivo. These experiments also showed that intact IgG directed to either RT1-B or RT1-D had an immense suppressive effect on the arthritis development, which we assume is a consequence of Ab-mediated depletion of MHC-II+ cells during T cell priming. The most plausible explanation for the suppression of arthritis in rats treated with OX6 and OX17 IgG is therefore that disease-initiating T cells are depleted during priming, because activated CD4 T cells in the rat are MHC-II+ (40). However, we observed a significant reduction of B cells upon Ab treatment, which raises the interesting question as to whether B cells play a role as APCs in PIA. The strong opsonizing capacity of the anti–RT1-B and RT1-D Abs may also explain why in some experiments rats treated with anti-RT1-D F(ab′)2 developed a slightly less severe arthritis compared with vehicle controls because both the OX6 and OX17 F(ab′)2 preparations contained small amounts of undigested IgG. However, the conclusion from the OX17 and 14-4-4S F(ab′)2 treatments is that RT1-D–restricted Ags play a very limited role in PIA, as both F(ab′)2 fragments efficiently block RT1-D/TCR interactions. Thus, despite being a polyclonal disease, only one of the two MHC-II molecules appears to be involved in the priming of the arthritogenic T cell response. 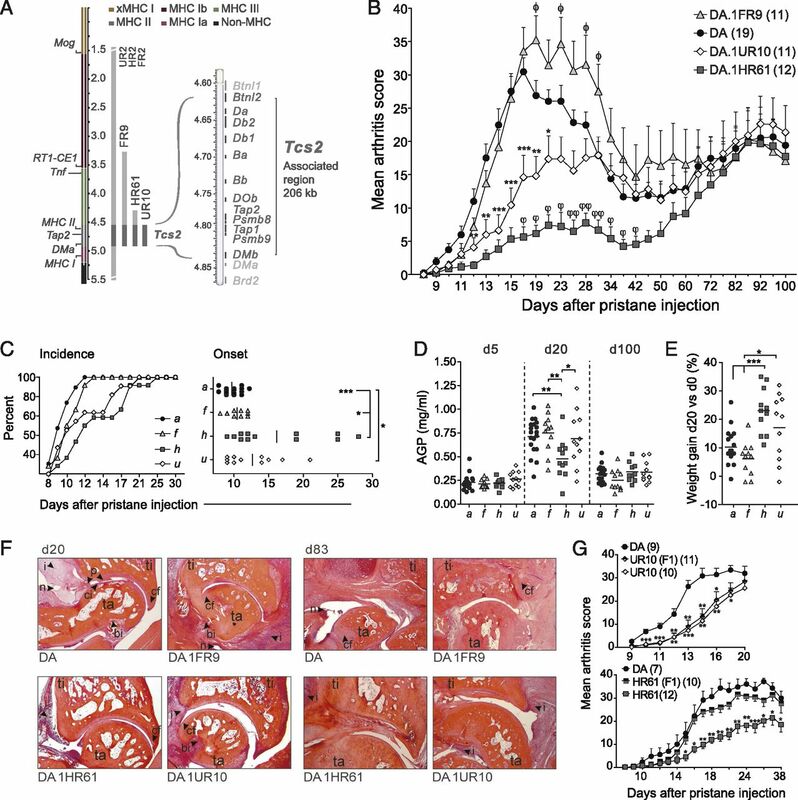 In addition to the effect in acute PIA, treatment with OX6 F(ab′)2 also influenced the development of chronic disease, suggesting that the initial priming in PIA is important to establish a pool of arthritogenic memory T cells. The pathogenic role of T cells in established RA is not yet defined (6, 41). However, T cell–depletion experiments in our laboratory suggest that T cells do contribute to the development of chronic PIA (J. Tuncel and S. Haag, unpublished data). It was therefore surprising to see that MHC-II polymorphisms did not influence the severity of chronic PIA, and that initially protected strains, such as DA.1HR61, later developed severe chronic disease. It is possible, however, that acute and chronic PIA rely on vastly different antigenic repertoires, which would explain why DA.1HR61 eventually would succumb to severe arthritis. Support for this notion comes from experiments in DA.1F rats, which show that T cells recognize different collagen Ags in acute and chronic PIA (12). We did not identify cartilage-specific peptides on MHC-II in the present study, but we did identify peptides derived from ubiquitous RA-related Ags, such as fibrinogen, fibronectin, and hnRNP-A2. Pristane-primed T cells have been shown to respond in vitro to challenge with hnRNP-A2 (42). However, whether hnRNP-A2 acts only as a T cell Ag is unclear because this nucleic acid–bound protein also can stimulate T cells through activation of TLRs in Mϕ (16). We also found several Ii-derived peptides among the peptides that were eluted from RT1-B of DA, DA.1FR9, and DA.1UR10. The cell surface expression of the Ii-derived peptide CLIP has previously been linked to a lack of editing by DM (43, 44). However, the identified Ii peptides in our study are different from the canonical CLIP (45), and they likely bind to RT1-B after Ii proteolysis by outcompeting the canonical CLIP. Noncanonical CLIP peptides have also been associated with a reduced responsiveness to DM (46), raising the question as to whether RT1-B is less susceptible to DM editing compared with RT1-D. This assumption is supported by the fact that two key residues for the interaction with DM, αPhe51 and βPhe89, which are present in both RT1-D and HLA-DR, are not conserved in the RT1-B molecule. Importantly, the substitution of αPhe51 in HLA-DRα to αLeu51 has been shown to reduce the activity of HLA-DM to exchange peptides on HLA-DR (46, 47). Furthermore, the human ortholog to RT1-B, HLA-DQ, as well as HLA-DP, which is genetically associated with RA (2), do not require DM to from stable complexes (48). It therefore appears as an attractive hypothesis that an unedited repertoire, potentially due to different editing susceptibility of RT1-B by RT1-DM, contributes to the regulation of PIA and potentially RA. A crucial anchor position for the formation of stable peptide–MHC complexes is the P1 pocket in the peptide-binding groove. In RT1-D, as well as in the human and mouse orthologs, this pocket is occupied by large hydrophobic amino acids. This hydrophobic P1 pocket is not conserved in RT1-B or its orthologous molecules (49, 50). The least susceptible strains in our panel, DA.1UR10 and DA.1HR61, both encode His at position 24 in RT1-Bα, which was associated with a binding preference for Glu in P1. In the mouse, binding of Glu in P1 via αHis24 has been described for the RT1-B ortholog I-Ad (29, 51). Furthermore, it has been shown that Glu-containing peptides bind strongly to I-Ad at acidic pH, whereas the peptide dissociates from the molecule at neutral pH (29). Similarly, Glu-containing peptides on RT1-Bh and RT1-Bu might bind with high affinity in the acidic MHC-II compartment, which would allow their translocation to the cell surface. However, through the loss of a salt bridge, which is likely to occur between αHis24 and Glu in P1 at neutral pH, the peptide would rapidly dissociate from the MHC-II molecule on the cell surface. T cells with self-reactive TCRs would therefore have less time to find their cognate Ag, which could explain the delay in onset and reduced arthritis severity in DA.1UR10 and DA.1HR61. In conclusion, in the present study we show that MHC-II polymorphisms control T cell activation and arthritis severity in a rat model of RA that does not rely on a single peptide–MHC interaction. To our knowledge, this is the first study that directly compares a large number of naturally derived alleles on a fixed genetic background and provides a functional link between amino acid variants in an MHC-II molecule and disease development. Our data suggest that amino acid variation in the P1 pocket influences the stability and editing susceptibility of RT1-B and consequently the development of PIA. Variant interaction of MHC-II molecules with DM and DO and efficiency of peptide editing are increasingly discussed to play a significant role in the pathogenesis of autoimmune diseases (50, 52, 53). PIA is a valuable model system to dissect the complex association between MHC genes and autoimmunity. Understanding the mechanisms leading to joint-specific inflammation in PIA is therefore certainly of relevance also for RA. We thank Kristina and Carlos Palestro and Evelina Wernersson for taking care of the animals, and we are grateful to Donna M. Eckert at the Genomics Institute of the Novartis Research Foundation for technical assistance and Emma Mondoc for help in preparing samples for histology. This work was supported by grants from the Crafoord Foundation, the Kock and Österlund Foundation, the Knut and Alice Wallenberg Foundation, the Swedish Association against Rheumatism, the Swedish Medical Research Council, the Swedish Foundation for Strategic Research, European Community’s Seventh Framework Program (FP7/2007–2013) Grant HEALTH-F4-2010-241504 (EURATRANS), and the European Union Innovative Medicines Initiative Project BTCure. T cell selection quantitative trait locus 1/2.
. 1987. The shared epitope hypothesis. An approach to understanding the molecular genetics of susceptibility to rheumatoid arthritis. Arthritis Rheum. 30: 1205–1213.
. 2012. Five amino acids in three HLA proteins explain most of the association between MHC and seropositive rheumatoid arthritis. Nat. Genet. 44: 291–296.
. 2014. A genome-wide association study of rheumatoid arthritis without antibodies against citrullinated peptides. Ann. Rheum. Dis. DOI: 10.1136/annrheumdis-2013-204591.
. 2014. Fine mapping seronegative and seropositive rheumatoid arthritis to shared and distinct HLA alleles by adjusting for the effects of heterogeneity. Am. J. Hum. Genet. 94: 522–532. 2003. Evolving concepts of rheumatoid arthritis. Nature 423: 356–361.
. 2014. Of mice and men: how animal models advance our understanding of T-cell function in RA. Nat Rev Rheumatol 10: 160–170.
. 1993. T cell receptor V beta gene bias in rheumatoid arthritis. J. Clin. Invest. 92: 2688–2701.
. 1993. T-cell receptor V-gene usage in synovial fluid lymphocytes of patients with chronic arthritis. Hum. Immunol. 37: 237–251.
. 2002. Glycosylation of type II collagen is of major importance for T cell tolerance and pathology in collagen-induced arthritis. Eur. J. Immunol. 32: 3776–3784.
. 1999. Arthritis provoked by linked T and B cell recognition of a glycolytic enzyme. Science 286: 1732–1735.
. 2006. 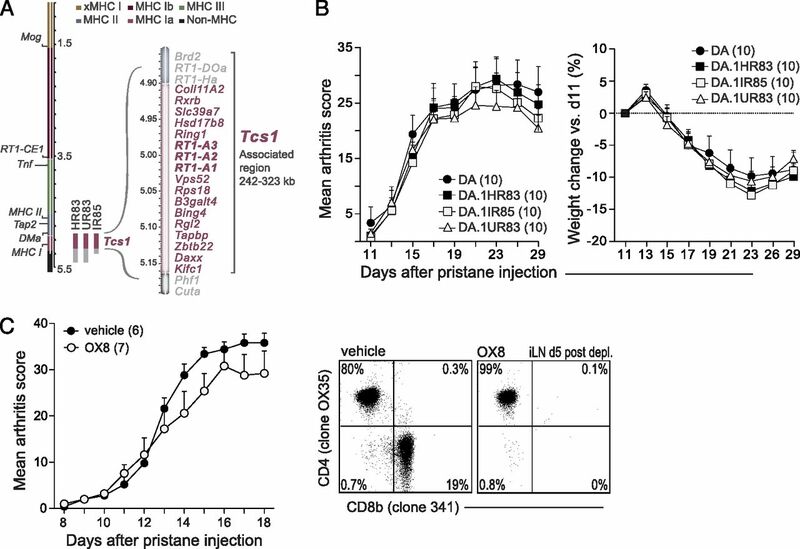 Pristane, a non-antigenic adjuvant, induces MHC class II-restricted, arthritogenic T cells in the rat. J. Immunol. 176: 1172–1179.
. 2012. Class II major histocompatibility complex-associated response to type XI collagen regulates the development of chronic arthritis in rats. Arthritis Rheum. 64: 2537–2547.
. 1996. Pristane-induced arthritis in rats: a new model for rheumatoid arthritis with a chronic disease course influenced by both major histocompatibility complex and non-major histocompatibility complex genes. Am. J. Pathol. 149: 1675–1683.
. 2009. Detection of arthritis-susceptibility loci, including Ncf1, and variable effects of the major histocompatibility complex region depending on genetic background in rats. Arthritis Rheum. 60: 419–427.
. 2002. Genetic links between the acute-phase response and arthritis development in rats. Arthritis Rheum. 46: 259–268.
. 2011. Nucleic acid-stimulated antigen-presenting cells trigger T cells to induce disease in a rat transfer model of inflammatory arthritis. J. Autoimmun. 36: 288–300.
. 2003. Identification and isolation of dominant susceptibility loci for pristane-induced arthritis. J. Immunol. 171: 407–416.
. 1994. Role of the bowel flora for development of immunity to hsp 65 and arthritis in three experimental models. Scand. J. Immunol. 40: 648–652.
. 2014. Natural polymorphisms in Tap2 influence negative selection and CD4:CD8 lineage commitment in the rat. PLoS Genet. 10: e1004151. 2010. FELASA guidelines for the accreditation of health monitoring programmes and for testing laboratories involved in health monitoring. Lab. Anim. 44: 69.
. 1997. Genetic analysis of mouse models for rheumatoid arthritis. In Human Genome Methods 215. Adolph K. W., ed. CRC Press, New York, p. 215–238.
. 2010. Breaking T cell tolerance against self type II collagen in HLA-DR4-transgenic mice and development of autoimmune arthritis. Arthritis Rheum. 62: 1911–1920.
. 2013. C57BL/6 mice need MHC class II Aq to develop collagen-induced arthritis dependent on autoreactive T cells. Ann. Rheum. Dis. 72: 1225–1232.
. 2009. Naturally presented peptides on major histocompatibility complex I and II molecules eluted from central nervous system of multiple sclerosis patients. Mol. Cell. Proteomics 8: 2090–2101.
. 2010. Features and development of Coot. Acta Crystallogr. D Biol. Crystallogr. 66: 486–501.
. 1991. The major histocompatibility complex class II-linked cim locus controls the kinetics of intracellular transport of a classical class I molecule. J. Exp. Med. 173: 913–921.
. 1992. Effect of polymorphism of an MHC-linked transporter on the peptides assembled in a class I molecule. Nature 357: 211–215.
. 2004. Improved prediction of MHC class I and class II epitopes using a novel Gibbs sampling approach. Bioinformatics 20: 1388–1397.
. 2006. Peptide-binding motifs for the I-Ad MHC class II molecule: alternate pH-dependent binding behavior. Biochemistry 45: 6426–6433.
. 2006. Genetic analysis of completely sequenced disease-associated MHC haplotypes identifies shuffling of segments in recent human history. PLoS Genet. 2: e9.
. 1991. Cim: an MHC class II-linked allelism affecting the antigenicity of a classical class I molecule for T lymphocytes. Immunogenetics 34: 157–163.
. 1994. The distribution of Tap2 alleles among laboratory rat RT1 haplotypes. Immunogenetics 40: 45–53.
. 2004. Identification of a novel natural regulatory CD8 T-cell subset and analysis of its mechanism of regulation. Blood 104: 3294–3301.
. 2007. CD40Ig treatment results in allograft acceptance mediated by CD8CD45RC T cells, IFN-γ, and indoleamine 2,3-dioxygenase. J. Clin. Invest. 117: 1096–1106.
. 2013. Amelioration of arthritis through mobilization of peptide-specific CD8+ regulatory T cells. J. Clin. Invest. 123: 1382–1389.
. 1998. Differential expression of major histocompatibility complex class II genes on murine macrophages associated with T cell cytokine profile and protective/suppressive effects. Proc. Natl. Acad. Sci. USA 95: 6936–6940.
. 2005. MHC2TA is associated with differential MHC molecule expression and susceptibility to rheumatoid arthritis, multiple sclerosis and myocardial infarction. Nat. Genet. 37: 486–494.
. 2009. Genetic risk factors for rheumatoid arthritis differ in Caucasian and Korean populations. Arthritis Rheum. 60: 364–371.
. 2010. Genetic variants of STAT4 associated with rheumatoid arthritis in persons of Asian and European ancestry do not replicate in African Americans. Ann. Rheum. Dis. 69: 625–626.
. 1987. Synthesis and cell surface display of class II determinants by long-term propagated rat T line cells. Eur. J. Immunol. 17: 909–914.
. 2010. Arthritis: where are the T cells? Arthritis Res. Ther. 12: 122.
. 2007. The rheumatoid arthritis-associated autoantigen hnRNP-A2 (RA33) is a major stimulator of autoimmunity in rats with pristane-induced arthritis. J. Immunol. 179: 7568–7576.
. 1995. HLA-DM induces CLIP dissociation from MHC class II αβ dimers and facilitates peptide loading. Cell 82: 155–165.
. 1996. H2-M mutant mice are defective in the peptide loading of class II molecules, antigen presentation, and T cell repertoire selection. Cell 84: 543–550.
. 1992. HLA-DR molecules from an antigen-processing mutant cell line are associated with invariant chain peptides. Nature 360: 474–477.
. 2008. Complexes of two cohorts of CLIP peptides and HLA-DQ2 of the autoimmune DR3-DQ2 haplotype are poor substrates for HLA-DM. J. Immunol. 181: 5451–5461.
. 2012. Crystal structure of the HLA-DM–HLA-DR1 complex defines mechanisms for rapid peptide selection. Cell 151: 1557–1568.
. 2010. HLA-DP, HLA-DQ, and HLA-DR have different requirements for invariant chain and HLA-DM. J. Biol. Chem. 285: 40800–40808.
. 2001. A correlation between the relative predisposition of MHC class II alleles to type 1 diabetes and the structure of their proteins. Hum. Mol. Genet. 10: 2025–2037.
. 2012. On the perils of poor editing: regulation of peptide loading by HLA-DQ and H2-A molecules associated with celiac disease and type 1 diabetes. Expert Rev. Mol. Med. 14: e15.
. 2003. Specificity of peptide selection by antigen-presenting cells homozygous or heterozygous for expression of class II MHC molecules: The lack of competition. Proc. Natl. Acad. Sci. USA 100: 5330–5335.
. 2013. Mechanisms of peptide repertoire selection by HLA-DM. Trends Immunol. 34: 495–501.
. 2014. HLA-DM and HLA-DO, key regulators of MHC-II processing and presentation. Curr. Opin. Immunol. 26: 115–122.